The table’s main purpose is to provide a flat,secure and stable surface for the work piece to move over. In larger table saws, the table is usually made from cast iron. Cast iron is very heavy, which adds stability. 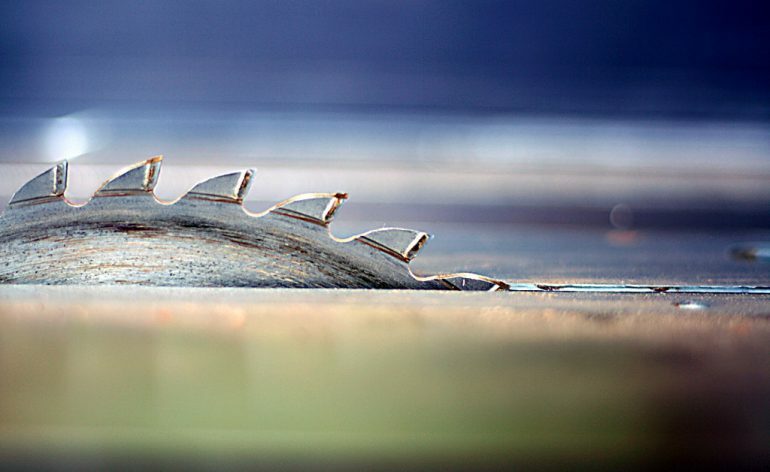 It is also very durable, having a heavy table also cuts down on the amount of vibration that the saw creates. leading to a smoother experience. 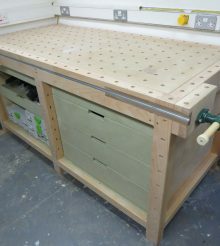 a side extension can be added to one or other side of the table saw to offer support for larger work-pieces, making them safer to manage, again these can increase stability bu adding more weight to the table. Again on larger cabinet saws, these tend to be cast iron, but alternatives are often used on smaller saws designed to be a bit more portable. 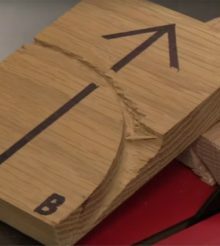 The rip fence is as important as any other part of the table saw, it keeps the piece of wood you are cutting exactly parallel to the saw blade. The fence will usually run on rails at the front and back of the saw and is secured by twisting and clamping a leaver. The rip fence should run smoothly and at all times be parallel to the blade. One great feature of some saw fences is the ability to draw it back so that end of the fence is in line with the saw blade allowing you to rip warped boards. The miter gauge is used for when you are performing cross cuts on your table saw. 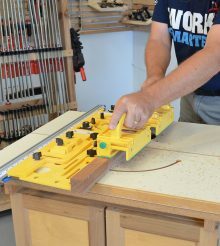 The miter gauge will run in one of the miter slots on your table saw. There are usually two miter slots in the table, one either side of the blade depending on which side you are cutting. from. Although a lot of time you may be cross cutting your work piece at 90 degrees, the miter gauge will allow you to set an angle angles anywhere between 30 – 90 degrees. the slots are factory machined into the table and are universally set a 3/4 inch wide and 3/8 inch deep. This allows you to purchase a vast array of aftermarket miter gauges and table saw jigs.